JUNE 5, 2000: CANNES - They have an unqualified love for Jerry Lewis, Mickey Rourke, and American "B" cult directors. But why, LA moguls growl, are the French so hostile to mainstream, market-driven Hollywood? The annual Cannes Film Festival is regarded as especially snobby, its Competition adverse to even the snazziest studio product. It's been four years since Cannes's director, Gilles Jacob, has set foot in LaLa land. For Cannes 2000, American execs were unanimous that Gladiator would have provided for an awesome opening night. And why not a closing night of Tom Cruise and Mission: Impossible 2? Instead, the 53rd Cannes Fest went stubbornly Francophone, choosing to begin with a tired Gérard Depardieu-starring costumer, Vatel, and concluding with Stardom, a funny but superficial satire on the fashion industry by Quebec's Denys Arcand. That neither of those films was distinguished fueled the American ire. Shouldn't upbeat Hollywood be paranoid? Jacob has appointed jury presidents who routinely encourage their colleagues to award Cannes's prestigious grand prize, the Palme d'Or, to difficult, downbeat European art movies. The Martin Scorsese-led 1998 jury went for Theo Angelopoulos's Eternity and a Day. The infamous David Cronenberg-led 1999 jury, which gave not a single prize to the seven American films in Competition, saved its Golden Palm for the tiny Belgian film Rosetta. For the year 2000, Luc Besson was Hollywood's Great White Hope. Here was a Cannes jury president who has made action films with spectacle and special effects and aimed at popular audiences: Nikita, The Big Blue, The Fifth Element, the recent The Messenger: The Story of Joan of Arc. Besson is the most Hollywood of French filmmakers, so maybe he would push his jury (Jeremy Irons, Kristin Scott Thomas, Jonathan Demme, et al.) to honor the American-star-filled big-budget pictures premiering in the Competition: the Coen Brothers' O Brother, Where Art Thou?, James Ivory's The Golden Bowl, James Gray's The Yards, and Neil LaBute's Nurse Betty. On the other hand, serious critics at Cannes, including Americans (including highbrow me), viewed Besson's presidency with trepidation, fearing he would take a philistine, anti-intellectual approach to his jurying. At an opening-day press conference, a journalist asked him whether his jury could support the typical Cannes winner, a cerebral movie that has trouble attracting an audience. "I actually don't agree with you," Besson replied. "If you look at the Palm winners of the last 30 years, you see that many were popular, successful films. For the broader public, the Palm choices are a little signal: these are the films we want to highlight. Look at Rosetta, which won last year and which was a great success." Eleven days and 23 Competition films later, Luc Besson's jury announced its winners at a short, elegant closing-night ceremony. The verdict? It must be said that the choices were reasonable and intelligent, pleasing to most factions, and appeasing to most of Besson's critics. The Special Jury Prize was shared by two demanding, offbeat works, Samira Makhmalbaf's Blackboards (Iran) and Roy Andersson's Songs from the Second Floor (Sweden). Best Actor went, appropriately, to Hong Kong superstar Tony Leung, for Wong Kar-Wai's In the Mood for Love. Taiwan's Edward Yang won Best Director for the three-hour film admired by practically everyone, Yi Yi/A One and a Two. Even Hollywood got something, Best Screenplay for the zesty screwball comedy writing of John C. Richards and James Flamberg in Nurse Betty. With everybody fairly happy, the Besson jury could go wild and controversial, giving Lars von Trier's much-debated Dancer in the Dark the Palme d'Or and its Icelandic pop-music star, Björk, the Best Actress award. Mostly cheers, but many jeers. British critics and many Americans (me among them) found the movie maudlin and clumsily shot, the narrative implausible, and Björk's performance fatally unprofessional. 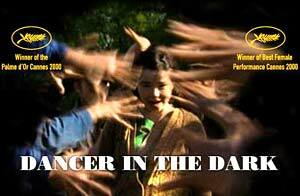 Variety called Dancer in the Dark "a nearly 2-1/2-hour demo of auteurist self-importance that's artistically bankrupt on almost every level." But Trier, who's most famous for Breaking the Waves, is the Prince of Denmark for European critics, especially those crazy French, who went mad for this faux musical instant "masterpiece." They adored the musical numbers and Trier's jerky handheld camera; they defended the melodrama by invoking Brecht and Sirk. What's it about? Björk portrays a Czech factory girl who's living in Washington (the state) in the 1960s and playing Maria in an amateur production of The Sound of Music. Although she's going blind herself, she hides away money for an operation to save her 12-year-old son's sight. But tragedy ensues, and she's put on trial for murder. Found guilty, she could be hanged. Earlier in the week, I'd squeezed into the packed press conference for Dancer in the Dark. Trier was there, and co-star Catharine Deneuve, who plays an improbable assembly-line worker. Missing was Björk, though she was somewhere in Cannes. This was the final disruption of Trier's project by the former Ice Cube. During the shooting, she ran away from the set for days at a time, leaving cast and crew hanging. Flanked by lawyers, she threatened to pull out of the production in the middle. Had Björk gone bonkers? There were piles of stories circulating about her erratic behavior on the shoot. One weird, unverified rumor was that someone walked in on her one day as she was trying to eat her costume. "It has been terrible," Trier admitted about working with Björk, whom he had cast after watching several of her music videos. "I found out that Björk is not an actor, which was a surprise to me, because she's so professional. But she was not acting, she was feeling everything that happened to her in the story, and reacting to it, which was extremely hard for her, hard for everybody. She was like a dying person . . . but I'm pleased with what she did. It was the only way she could do it." Deneuve agreed, lecturing the press about its obsession with Björk's antics. "I think it would be perverse to concentrate on what's behind the scenes. No film goes without tension, crying sometimes. Björk is a wonderful, touching person. She didn't act, she was like a child who couldn't take anymore and runs away from school. . . . She's absolutely unique. Very very different, very shy. To come here today with so many people, she'd see this as a kind of crucifixion." For the closing-night ceremony, Björk did appear, even walking up Cannes's famed red carpet with Trier. She looked dazed and suspicious, even as she accepted the Best Actress award with a two-sentence speech: "I am very grateful, Thank you very much." It was Trier who reached out to her - dramatically, melodramatically - upon accepting the Palme d'Or: "I have to say thanks to Björk, and she doesn't believe me when I say it, but if you see her, tell her I love her very much." A few seconds later, Björk stumbled to the stage and stood by her director. They didn't dare hug, there were no Oscar-type tears, but it was, I suppose, some kind of rapprochement. Okay, let's talk about the American presence at Cannes. The best-liked film by far in Competition was Nurse Betty, in which Renée Zellweger plays a sweet-tempered, Doris Day-like waitress who after her sleazoid husband's murder by hitmen (Morgan Freeman, Chris Rock) takes to the road in search of her real love, a TV soap-opera doctor (Greg Kinnear). The ensemble is winning, and so is the delicate direction by Neil LaBute, who's infamous for his misogynist/misanthropist duo of In the Company of Men and Your Friends & Neighbors. The Coen Brothers' O Brother, Where Art Thou?, a comedy romp through the 1930s South with three convicts on the run (George Clooney, John Turturro, Tim Blake Nelson), was funny in parts, exhausted in its final act, and more distinguished for its superb soundtrack of blues and early country music than for its unambitious narrative. Minor Coens, though Clooney with a moustache holds the screen in a charismatic, Clark Gable-like performance. The Merchant Ivory The Golden Bowl was a film I quite admired -- this may be as good as Henry James's impossibly complex novel can get on screen. Nick Nolte is great as Sam Verver, a turn-of-the-century robber baron, a gentler, kinder Citizen Kane. But many who saw the film at Cannes found it cold and dispassionate, and they objected to the casting of too-modern Uma Thurman as the tormented, petulant Charlotte Stant. I thought she was okay. James Gray's The Yards, his follow-up to the fine 1994 gangster film Little Odessa, was booed at the press screening and criticized for the cliché'd familiarity of its crime story: young Mark Wahlberg exits prison determined to go straight but gets embroiled with the wrong friend (Joaquin Phoenix) and the wrong relative (James Caan). He's back in trouble with the law. Gray's script is amiss, but his direction is nicely moody and European. And outside of Competition? John Waters's Cecil B. Demented, in which a coven of underground movie freaks kidnap a superbitch Hollywood star (Melanie Griffith) during a Baltimore visit, is genial and sometimes extremely funny -- i.e., the machine-gunning of a multiplex where the mainstream audience watches Patch Adams: The Director's Cut -- but the climactic scenes are disappointing. Darren Aronofsky's Requiem for a Dream is a much-accomplished follow-up to Pi, and let's hope there's an audience willing to brave the in-your-face visual onslaught of TV-induced and downer-pill madness (Ellen Burstyn is the victim) and heroin addiction (Jared Leto, Jennifer Connelly), all from an extreme novel by Last Exit to Brooklyn's Hubert Selby Jr.
Ang Lee's Crouching Tiger, Hidden Target, the first foray by the Taiwanese-born director of Sense and Sensibility and The Ice Storm into martial arts, was probably the most popular film at Cannes. What's not to like in this smart, sophisticated, spiritual tale with a cast of Hong Kong icons (Chow Yun-fat, Michelle Yeoh) and thrilling swordfights in the trees and skies, all enhanced by the technicians responsible for The Matrix? And the most overrated American film at Cannes? Girlfight, an amateurish, overwritten, stupidly politically correct tale of a young girl who becomes a boxer and, in her big bout, is matched against her boyfriend. He's supposed "to learn" that it's okay to box a woman and that there's nothing to be ashamed of if your girlfriend wins the fight. Yuk! What does it say of the Sundance Film Festival that, last January, Girlfight was the rage and the big prizewinner?